MkXIV Spitfires of No.41 Squadron engage Me262 jet bombers from KG51 over the Rhine, late 1944. 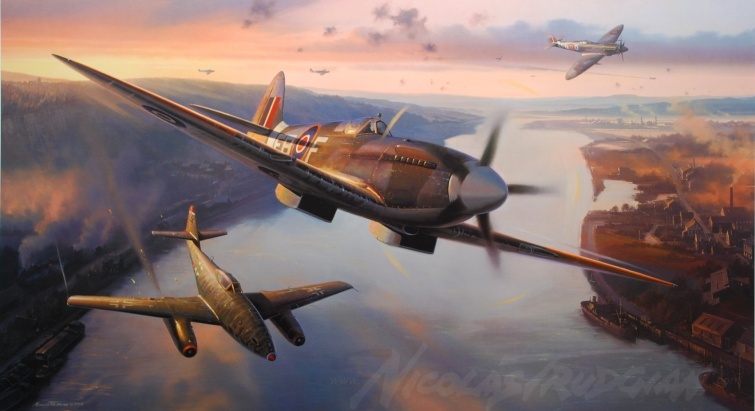 Amongst the final generation of piston-engined fighters, the MkXIV Spitfire with its mighty Griffon engine was one of the finest and fastest and, in the hands of a skilled RAF fighter pilot, still posed a major threat to the Luftwaffe's advanced new jet. Signed by five RAF Aircrew who flew combat in the European theatre during World War II. Signed by seven RAF Aircrew who flew combat in the European theatre during World War II.